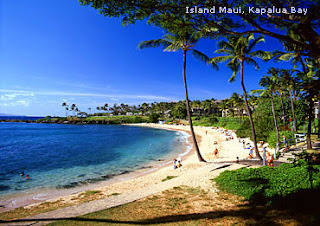 Hawaii (Hawaiian: Hawaiʻi) became the 50th state of the United States on August 21, 1959. It is situated in the North Pacific Ocean, 2,300 miles (3,700 km) from the mainland, at 21°18′41″N, 157°47′47″W. In the 19th Century, Hawaii was also known as the Sandwich Islands. In dialects of American English, "Hawaii" is pronounced at least three different ways: (IPA pronunciation: [hə.ˈwaɪ.ji], [hə.ˈwaɪ.i], [hə.ˈwaɪ.ʔi]). In the Hawaiian language, there is also some variation possible, but the most general pronunciation is [hə.ˈvəi.ʔi] or [hə.ˈwəi.ʔi]. This last Hawaiian pronunciation is often used by native-English-speaking Hawaii residents, as well. Archaeologic evidence points to earliest habitation in the 11th Century AD, probably by Polynesian settlers from the Marquesas, Raiatea and Bora Bora. 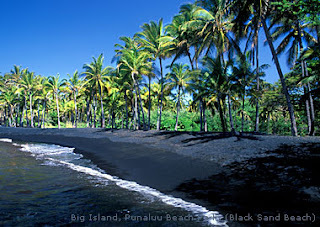 The first recorded European contact with the islands was in 1778 by British explorer James Cook. However, substantial evidence (Stokes 1932 for example) exists of earlier Spanish visits to Hawaii. Hawaii was an independent kingdom from 1810 until 1893, when the monarchy was overthrown. It was an independent republic from 1894 until 1898. It became annexed to the U.S. in 1898, but became a territory in 1900 and has been a state since 1959. The climate of Hawaii is typical for a tropical area, and is regarded as more subtropical than the latitude would suggest, because of the moderating effect of the surrounding ocean. Temp eratures and humidity tend to be less extreme, with summer high temperatures seldom reaching above the upper 80s °F, (27 °C) and winter temperatures (at low elevation) seldom dipping below the mid-60s (16 °C). Snow, although not usually associated with tropics, falls at high elevations on Mauna Kea and Mauna Loa on the Big Island in some winter months. Snow only rarely falls on Maui's Haleakala. Mount Waialeale (Waiʻaleʻale), on the island of Kauai, is notable for rainfall, as it has the second highest average annual rainfall on Earth, about 460 inches (38 ft. 4 in., or 11.7 m). Local climates vary considerably on each island, grossly divisible into windward (Koʻolau) and leeward (Kona) areas based upon location relative to the higher mountains. Windward sides face the Northeast Trades and receive much more rainfall; leeward sides are drier, with less rain and less cloud cover. This fact is utilized by the tourist industry, which concentrates resorts on sunny leeward coasts. Hurricanes are a rare occurrence in Hawaii, although it is probable that all the islands of Hawaii have been hit by a hurricane in the past. Until the 1950s' advent of satellites, many of the tropical cyclones which hit Hawaii were thought to be Konas, as the Kona and hurricanes seasons overlap. The worst hurricane to hit Hawaii was Hurricane Iniki in 1992, which showed that Hawaii was indeed vulnerable to a direct hit from a hurricane. 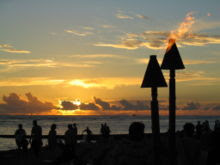 The movement of the Hawaiian royal family from the island of Hawaii to Maui, and subsequently to Oahu, explains why certain population centers exist where they do today. The largest city, Honolulu, was the one chosen by King Kamehameha III as the capital of his kingdom because of the natural harbor there, the present-day Honolulu Harbor. 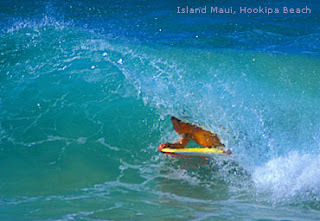 The largest city is the capital, Honolulu, located along the southeast coast of the island of Oahu. Other populous cities include Hilo, Kaneohe (Kāneʻohe), Kailua, Pearl City, Waipahu, Kahului, Kailua-Kona, Kihei (Kīhei), and Lihue (Līhuʻe).